Do you like brandy butter or brandy sauce with your Christmas pudding and mince pies? I’ve always liked brandy sauce with the pudding but love spreading brandy butter on mince pies. But how about brandy ice cream? I went a bit all-out yesterday with Jonathan and Lyndsey coming round for a meal in the evening, recreating a couple of the wonderful dishes I had recently at the brilliant Moro pop-up in the vintage clothes and home shop in Islington’s Chapel Market, Possessed N1 (recipes to come later). 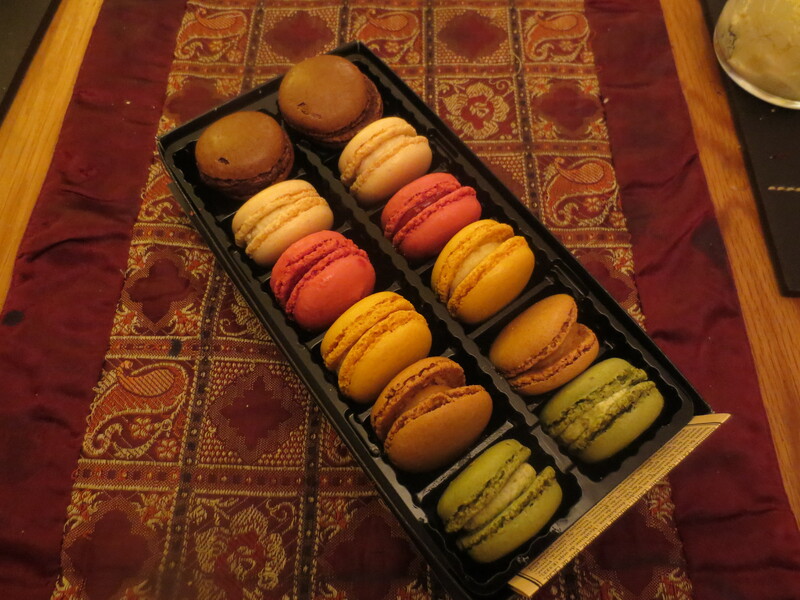 I thought with a pretty hearty starter and main course we wouldn’t need dessert but Sunday without dessert is not a good thing so I bought a box of Paul’s macarons in the morning to go with coffee. I love Paul’s macarons. I’ve bought the posher Laduree ones but Paul’s are the ones I like best and I’m always open to an excuse to treat myself to some. 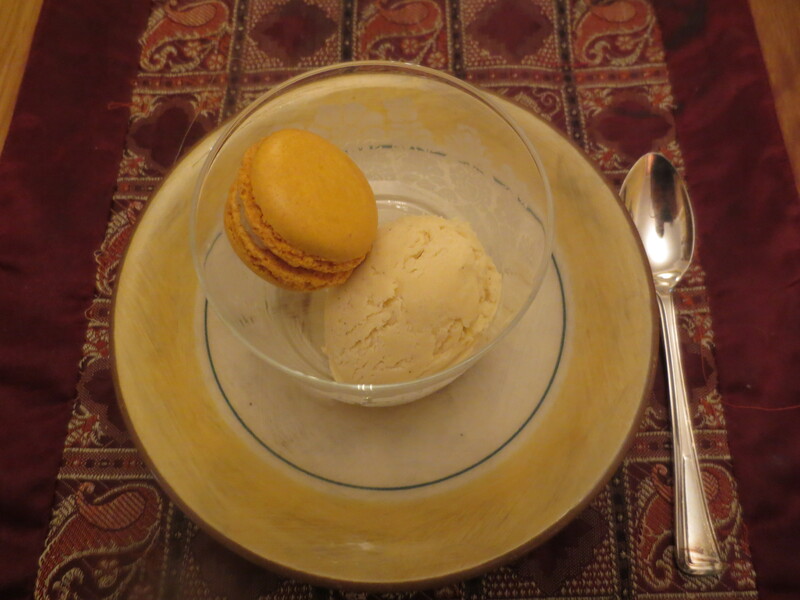 But later … an idea took hold … Sunday … dessert … Christmas coming. I could make some ice cream. The base of my ice-cream maker was still in my freezer. 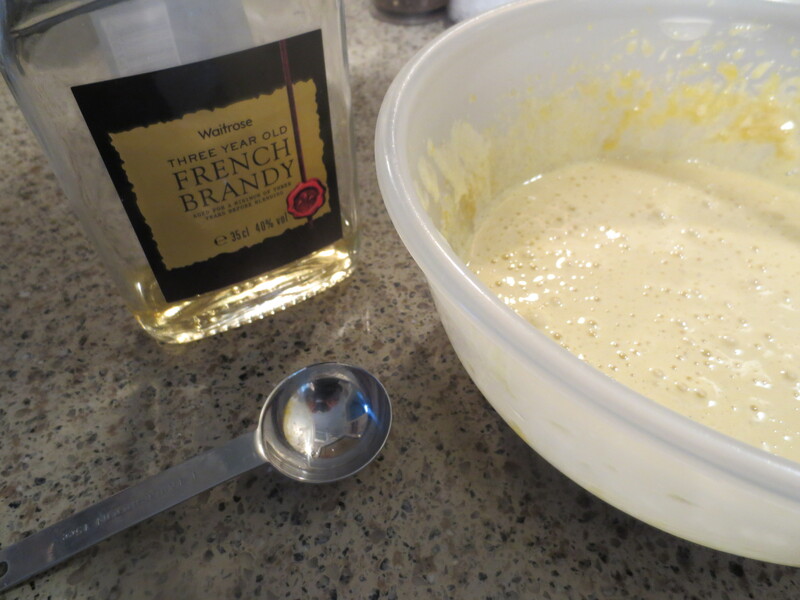 So how about making an ice cream version of brandy sauce, I thought. A vanilla ice cream flavoured with extra vanilla so the vanilla flavour really stood out and with some brandy too? 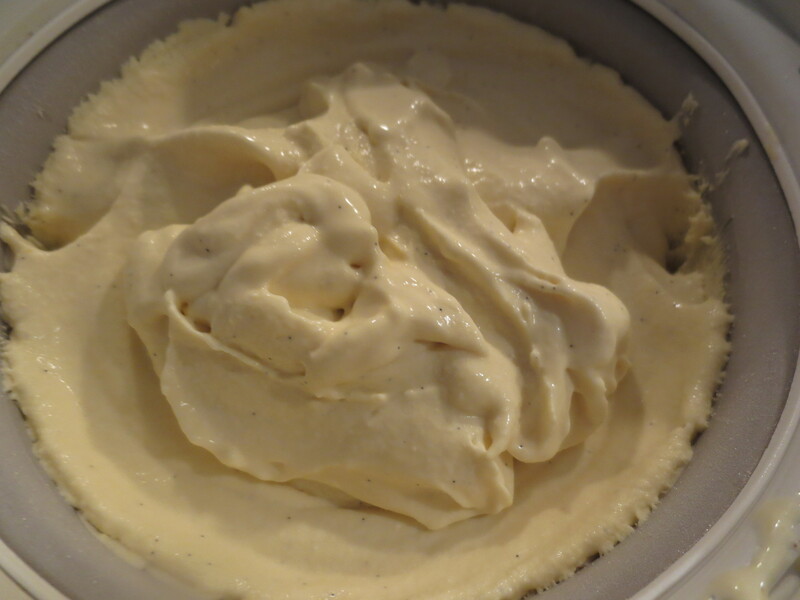 A vanilla ice cream is a quick thing to make. Or at least it seems that way given all the ice cream I’ve made this year! I followed my basic recipe: 6 egg yolks, 300ml whole milk, 300ml whipping cream, 1 teaspoon custard powder (or cornflour) and 120g caster sugar. But this time, instead of just a teaspoon of vanilla paste (or extract), I’d put in two. 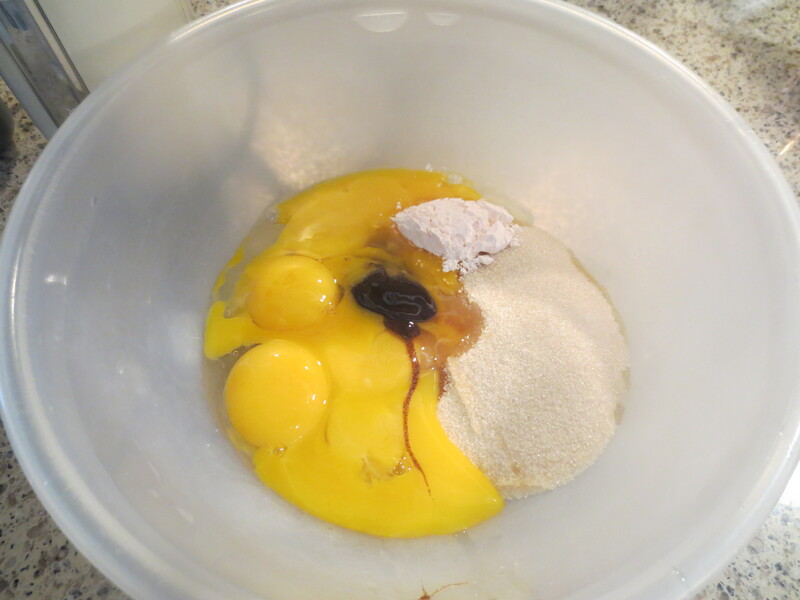 First of all beat the egg yolks, sugar, custard powder and vanilla paste until thick. I now always faithfully follow Delia Smith’s trick of adding the custard powder to stop the custard separating while you cook it. Sometimes life is too short to make a custard where you’re constantly anxious the whole thing will end in a separated disaster! Believe me, save your sanity and add the custard powder – or cornflour will work too. Especially if you’re working in a hurry. Now bring the milk just to the boil – when you see little bubbles appearing around the edge – and then pour slowly on to the egg mixture, beating all the time. Return the custard to the pan and then gently heat through until it thickens. Transfer to a bowl. Now add the brandy. There wasn’t a great deal of choice about the amount. My bottle of ‘cooking’ (i.e. cheap supermarket own label) brandy was almost empty. I squeezed out two and a half tablespoons, but fortunately that seemed the right amount. I then added a tablespoon of Marsala wine. My dad always made brandy sauce with brandy and sherry (I didn’t have sherry so thought Marsala a good alternative). The sherry/Marsala lightens and sweetens the brandy flavour in a great way so it’s not too harsh. Check the taste to see if you need more sugar or alcohol. Remember that when you freeze the custard the flavour will dampen down a bit so before freezing the sweetness and flavours should be quite strong. Now leave the custard to cool. When it’s cold, whip the cream lightly until just thickening. Don’t whip it too much or you’ll have lots of air in your ice cream spoiling the smooth creamy effect you want to achieve. Once the creamy custard is ready, transfer to your ice cream maker. Churn until it reaches a nice soft scoop stage then transfer to a freezer contained for storage. If you make it well in advance of eating, then remember to take it out of the freezer for a few minutes to soften before serving. We all enjoyed our ‘Moro’ dinner and after the main course I asked if the others had room for dessert. Silly question! As it happened, Lyndsey and I only had room for one scoop of ice cream, but Jonathan managed two! It was a great success. The flavour was fabulous: the balance of brandy and Marsala and vanilla just right to make a rich flavoured and nicely boozy ice cream. And there’s still quite a bit left over for Christmas Day. Thanks Carina and happy Christmas to you! Made this for Christmas lunch with friends yesterday and it was a great hit – many thanks for an excellent recipe!